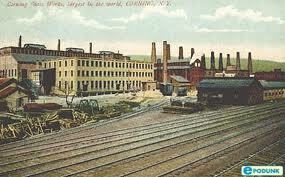 The Corningware being produced in Corning (the glassware is named after the city, not the other way round) was a by-product of the space age, the material of the glassware having been developed to harden the nosecones of the original rockets used by NASA in the 1960’s. Since then Corning has invested about 10% of its annual budget in research and development, and this in turn has led to innovations in a variety of fields, optical fiber among them. One of the fields of interest at Corning was organ and other types of transplants, using some of its glass and fiber products. As soon as the laboratory at Corning heard about the train accident, they thought that this might be an opportunity to try out some of one of their new products on a human subject. So, George and the bodies of his brothers were immediately transported to Corning, and when he awoke in a hospital bed, George was asked if he might be willing to have the right leg of one of his brothers transplanted to his own. It was a dangerous procedure from which he might never wake up, but they would have two opportunities at the transplant, as they had the bodies of both of his brothers and both were in good condition. Cost would be covered by Corning; would he agree? It sounded outrageous. Implants in those days were in their infancy, and George had never heard a thing about them. Nevertheless, he thought long and hard about whether he wanted to risk it. He phoned his parents to ask their advice, and then decided to go ahead and chance it. The operation took 17 hours, and he had to stay in the hospital for six difficult months. But eventually, he had a responsive leg that did more-or-less what he wanted it to do. Months of physical therapy followed, as well as a series of casts, and finally, he had worked up to his present condition, able to live a normal life, although still wearing his flexible cast and dragging the leg. Naturally, he was most grateful to his deceased brothers, as without their matched DNA none of this would have been possible. What an amazing story. This is one of the topics that I teach to my Physical Therapist Assistant students and I have never heard of this being done like this before. Arms that have been severed have been reattached in some cases, but the donor and recipient are the same person! Boy, he was sure lucky he had two “good” donor legs with his same DNA that could be tried. My guess is that if the surgery was done today, he wouldn’t have that cast and the leg/foot wouldn’t drag. With the microneurosurgery done today, they would be able to connect the nerves up so that the limb would work normally. Also, notice, I am catching up. I have now read your May 8th entry on this 2nd of June. I think you’d better read the next couple of installments. It is a story that goes on for several posts, and not meant to be taken too seriously. I apologize for that, but blame George. Flattery will get you anywhere with me.